Pools in Utah are used primarily in the summer months, which is why most people start thinking a pool is a great idea during those months, right?! But here’s the deal, pools take time to build. 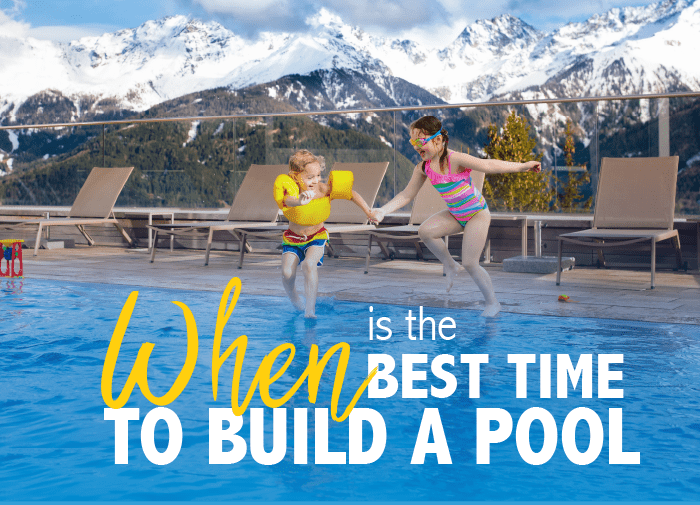 If you don’t start building early enough, by the time you want to throw a middle of summer pool party your super cool new pool might not be completed! If your pool is going to be used in the hot months of summer it needs to be built before then. So if we start the process in the fall or winter there’s no question you will be swimming next summer! Be SWIMMING by Spring not just getting started. You’ve decided you want a pool ready for summer so you figure you’ll call us in Spring. The problem is, everyone else is thinking the same thing. First come first serve, right? By early spring, we are usually already booked out through mid-summer. But, If you call us this fall or winter we can get you scheduled much sooner and have you swimming by Spring! We’re talking about landscaping. Building a pool requires digging…and lots of it. You’re going to want to give your landscaping some time to regrow and look beautiful again for the swimming months. We can get your pool built by late winter allowing your landscaping to recover and flourish through Spring. Did you know that concrete sets better in colder temperatures? Because it takes longer to dry out, it actually makes it stronger and more structurally sound. BONUS! Really all we are saying is, think ahead…way ahead. Let us give you something to look forward to through the fall and winter months as we work together to make you an outdoor oasis for you to step into the first day of summer (or sooner).